Awesome August has arrived, which means it’s almost time for a spring awakening… You will see on crispy August mornings new mint-green leaves sprouting, and bees and butterflies zooming over swathes of daisies turning their heads to the sun. Wake up and make your life a garden! No other country in the world can lay claim to the same sensational indigenous late winter and early spring colour that we can, with our fantastic Osteospermum hybrids, sold under the collective name of Cape Daisy. These ground-covering plants are loved by butterflies and thrive in full sun. They are spectacular in window boxes, in mixed containers or in single patio pots. For a mass of cheerful flower faces, few plants beat the beloved daisy bush (Argyranthemum frutescens). Every year more hybrids and colour variations appear, with each one seeming to be more floriferous and more compact than its predecessors. They are perfect for sunny patios, balconies, pool sides, or anywhere that a typical sense of spring awakening could be celebrated. Daisy bushes are at their most colourful in cooler months but flower repeatedly in summer if they are looked after well with ample water, feeding and a light clipping after a flower flush. Hot tip: Give your old pots a new lick of paint before planting them up with your daisies or invest in new pots roomy enough to allow them to grow into large cushions of flowers. It’s almost impossible to be upset about anything if you are standing in front of the golden daisy bush (Euryops pectinatus) in bloom – this indigenous shrub is just too cheerful! On a bright sunny day, the hundreds of butter-yellow daisies stand out against dense foliage and catch your eye from afar (and those of pollinators like bees and butterflies too!). Their greyish green, fern-like foliage is also attractive. Plant them en masse along garden paths or in rows of pots to make a real statement. They grow fast, are easy on water and flourish virtually everywhere, except in the coldest of climates. If you can only choose one fantastic early spring-flowering plant, make it a Clivia (also known as the Natal or bush lily). When the breathtaking orange flowers burst forth after winter they instantly banish any traces of the winter blues still lingering. More you need to know, is that they are easy to grow, evergreen, perennial and have lovely dark green leaves that are long and strap-like. The trumpet-shaped, brightly coloured flowers are arranged together in sturdy flower heads attached to fleshy stems. They last for several weeks and then give way to fleshy round berries that remain on the plant for months. Legend has it that Clivias bring good fortune if planted near your house. Good for dry shade gardens. Plant a compact and hardy Strawberry hybrid for a delicious crop of sweet fruit in summer till autumn. Keep it indoors on a sunny window sill or outside on a balcony in a pot or hanging basket. This is an ideal gift for a loved one as well. Sometimes you will find pots filled with three to four differently coloured flowers all in bloom at the same time. This is because quite a few cuttings of different hybrids are planted together to supply bright colour indoors or on a shady and protected patio. Keep your plants always moist, but not sopping wet. Never allow the soil to dry out completely. Prevent water on the blooms and closed buds, and keep the plants in good light or filtered sunlight and out of cold drafts, and they will keep on blooming for many weeks. After flowering, they can be planted out into the garden or in bigger pots, in the shade. 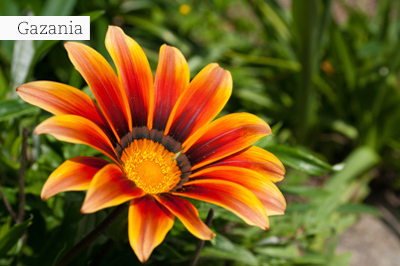 One way to describe Gazanias (more commonly known as Treasure Flowers) is to say that they have large, stripy, or boldly coloured daisy-like flowers in shades of orange, white, yellow, pink, red and many bicolours, which open during the day and close at night. But, that does not say it all! Originating from South Africa, they can also withstand high heat and little water. They prefer sandy soil with excellent drainage and full sun. To initiate beautiful blooms throughout many months of the year, plant them into compost enriched soil and feed them monthly. If not yet done, roses can still be pruned in August. In very cold regions pruning end August is best in any case. After pruning, pull off all remaining leaves as they can harbour disease and pests. Spray bare stems to kill insect eggs and fungus spores, dig in compost, and a rose fertiliser. Add a fresh layer of mulch and water well afterwards. Butterflies bring a lovely, colourful and whimsical look to the garden. While feeding on plant nectar, they also collect pollen on their legs and carry this pollen to other flowers and parts of the garden, creating the opportunity for entirely new flower beds to spring up, in time!Without bees we will lose many vegetables and fruit which are pollinated by them. Unfortunately, their numbers keep on dwindling due to a lack of flowering plants in smaller gardens. You can encourage bees to your garden (even if it is just a garden in pots), in a few ways, one of which includes planting bee-attracting herbs. This list includes: Sweet basil, bergamot, catmint, French thyme, lemon balm, borage, mint, cotton lavender and lavender. Compost enriches the soil and helps retain water, and is easy and cheap to make. Combine brown and green material (like dead plants, dry leaves and cut-up sticks) in heaps of about 1m high and 1.5 m wide at the base. Keep moist and turn it over regularly as it heats up. Compost is ready when it is dark brown and has an earthy smell. Add compost activator to accelerate the break-down. Lavenders can be added into the edible garden for colour and fragrance. Lavender has antiseptic, antibacterial, analgesic and anti-depressant properties. It is used in treatment of headaches, insect bites, burns, acne, and insomnia. To do list for August…. No matter what the weather, your garden will always need feeding, feeding and even more feeding! Feed all shrubs and trees when you see new shoots sprouting. Dig one bag of compost and a handful of superphosphate or bonemeal, or balanced fertiliser into every square meter of bed. Remember to water well after feeding. Mulch and feed your fuchsias. Prune and feed your hydrangeas. Apply acid compost as mulch. Primula seed can be harvested and stored for next season. Buy summer bulbs like amaryllis, different coloured Arum lilies, Gladiolus and Dahlias, as soon as they’re available. Store in a cool dry place until planting. August is the time to plant your summer annuals such as Petunias, Lobelias, Dianthus, Begonias, Gazanias and marigolds. Remember to keep covered those plants which are frost-tender. Don’t forget to stake newly planted trees and standards to prevent them from toppling over or snapping in the August wind. Revive your indoor plants by cleaning the leaves with a wet cloth or leaf-wipe tissue and giving each plant a diluted dose of liquid fertiliser. Start preparing your lawn for the summer. Rake out any dead and matted undergrowth (add these rakings to the compost heap or use as mulch for the flower beds) and aerate the lawn to improve its absorption of water and nutrients. Aeration can be as simple as stabbing holes into the lawn with a garden fork. Apply mulch and lawn fertiliser to newly raked and aerated lawns. Water well afterwards.